Crane flies belong to the largest family of true flies in the world, the Tipulidae family, which contains over 14,000 crane fly species. More than 500 kinds of crane flies inhabit the United States. The adults resemble overgrown, clumsy mosquitoes with long legs. The wormlike larvae are aquatic or inhabit moist terrestrial habitats such as soil or decaying vegetation. Adult crane flies are harmless and do not bite or sting. Crane flies are primarily beneficial, but a few species have larvae that can damage plants. Frogs, birds, lizards, fish, spiders and dragonflies eat crane flies. Crane flies are sometimes short-term nuisances because the adults can occur in large numbers, hanging from vegetation and coming to lights at night. They are short-lived and usually don't feed, although they may eat nectar. They last long enough to mate and lay eggs. The best strategy to control the adults is just to wait through their lifespan. In an article he wrote about European crane fly control, Daniel C. Peck of Cornell University advised controlling larvae because the adults are difficult to treat. Two economically important species of crane flies native to Europe were accidentally introduced into North America. The European crane fly and the common crane fly occur in various places, including the Pacific Northwest and New York. The larvae, called leatherjackets, feed on plant roots and stems and are pests of lawns and turf. The State of Maine encourages using integrated pest management to control them, with pesticide use a last resort. Rake leatherjackets from lawns at night when they come to the surface to feed. Another control method is to soak an area of lawn, cover it with a tarpaulin and then collect and destroy the larvae that come to the surface under the tarpaulin to escape the excessive soil moisture. Encourage the larvae's natural enemies, such as birds and predaceous beetles. Remove excess thatch from lawns because the larvae feed primarily right below the thatch. Kill the larvae right after they hatch from the eggs by not watering the lawn during fall. Biological control agents include the nematodes Steinernema feltiae and Steinernema carpocapsae, and a fungus, Beauveria bassiana. Limit local populations of terrestrial crane fly species by removing layers of decaying leaves and areas of other decomposing, moist vegetation. In New York, imidacloprid and trichlorfon resulted in 73 to 87 percent control against European crane flies when used in spring or fall. 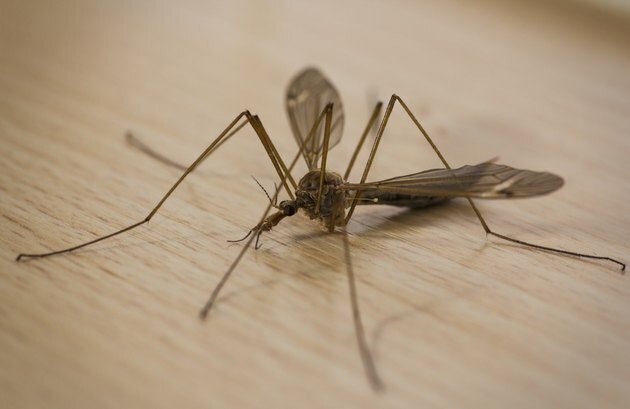 Pesticide is most effective against the larvae when applied to coincide with egg laying; the common crane flies lay eggs during spring and fall, and the European crane flies lay eggs only in fall. The effectiveness of carbaryl and chlorpyrifos was more variable than that of imidacloprid and trichlorfon in New York. University of California Pest Management Online, however, lists carbaryl as most effective against crane flies; it is followed by bifenthrin. Contact a professional for evaluating the use of a pesticide for your lawn because the use of all of these pesticides is restricted to certified applicators. Diazinon, a pesticide used by homeowners before 2004 for turf pest control, is no longer available for home use and not registered for home lawn use because of its toxicity to birds and fish. Near bodies of water, large groups of crane flies that have aquatic larvae can occur. The larvae live at the bottom of streams and lakes, and they are an important part of the ecosystem. Both adults and larvae are food for many animals. Larvae consume live or decaying plant matter, although some eat smaller aquatic insects. Some species are indicators of clean, healthy aquatic environments. Control measures aren't recommended for these native species of crane flies. What Causes Piles of Dirt in Your Yard?